Táhirih – an important figure in Persian history – helps us imagine a more diverse feminism and a more progressive Middle East. Her legacy is not limited to Bahá’ís but belongs to all of us. and I would turn the day as dark as hell". - Táhirih. Tahirih. 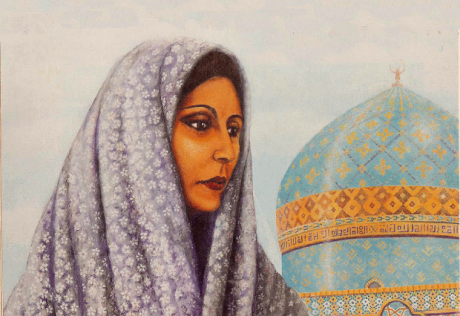 Illustration by Ivan Lloyd in Tahirih – “A Poetic Vision” (Desert Rose Publishing). Around the same time as the 1848 Seneca Falls Convention, commonly seen as the first chapter of the women’s movement in the West, several thousands of miles away, in Iran, a lone woman was creating ripples. Eighty one Babis – the precursors of present-day Bahá’ís – were gathered in the village of Badasht after their leader, the Bab, had been captured by the king. The emerging religious movement needed to decide what to do next and define the identity of the movement in a moment of crisis. One of the leaders in Badasht, Táhirih - a poet, theologian, and the only woman among the 81 Babis – advocated for a definitive break from Islam. While to Bahá’ís this episode represents the point of break with Islam, Táhirih – also known as Qurrat al-'Ayn or Fatimah Baraghani – remains relatively unknown in mainstream feminism. People like University of Virginia professor Farzaneh Milani, however, think that Badasht should be seen as “the beginning of women’s movement” in the Middle East. Born in Qazvin in the mid-1810s into a family of high clerics, Táhirih did not stake any claims to feminism. But her journey indeed gives us the opportunity to trace an alternative history of modern feminism, one that is deeply tied to its Middle Eastern roots. This differs from the usual picture showing the West as the source of all good or all evil, and other cultures as receiving vessels. What made Táhirih and the Babi movement revolutionary comes down to their progressive understanding of history. They believed that God’s will unveils from time to time, according to culture and context. Religion is relative, not absolute, and, most crucially, time moves forward. This matters because conceptions of time and social change are intertwined. To Mangol Bayat, an independent Iranian scholar, the Babi’s progressive conception of history goes back to twelfth century Ismailis of Alamut, who thought that the Qur’an’s inner truth would unfold progressively. Abbas Amanat, a Yale history professor, traces this philosophy’s roots back to sixteenth century Persian theosophers, especially Mulla Sadra and his students. Most religious traditions have important female figures. What makes Táhirih remarkable is that she did not play the roles of a good daughter, wife, or mother – at least in the traditional sense. Deeming herself a bigger place in the world, Tahirih left her husband and children in order to spread the word of what she thought as a new age. Our hero left her native Qazvin for Najaf, Baghdad, Karbila, then went back to Qazvin, and finally travelled through Tehran and Mazandaran. According to Farzaneh Milani, freedom of movement represents one of Táhirih's most meaningful struggles in a time when women were expected to stay at home. Not surprisingly, people in power vilified her. In his chronicles, a royal court historian named Sepehr accused Táhirih of dressing like a “peacock of paradise” and letting her male followers “come to her throne and kiss those lips of hers which put to shame the ruby of Ramman, and rub their faces against her breasts, which chagrined the pomegranates of the garden.” Sepehr – who was not exactly a restrained writer – also alleged that Tahirih recommended the marriage of one woman to nine men. The mix of hate and fascination that Táhirih produced among her enemies apparently reached the Shah of Iran, who – some sources indicate – asked for the poet’s hand in marriage. “… I’ll walk the beggar’s path – though bad – it’s mine,” she wrote in a poem, presumably as a response. “It’s Alexander’s road that you pursue. Ride past my camp, on your road to nowhere. May you have all you wish, for it’s your due”. Why would she be so disruptive? To Táhirih, it seems, unveiling served as shock therapy, a way of attacking prevailing norms, generating intense emotions, and mobilising other Babis to action. Her unapologetic deliberate radicalness in appearing unveiled in public can be read as a form of protest that only she, as the sole woman among several men, had access to. At the time, Babis were trying to figure out their relation to Islam and decide whether Shari’a still applied. Táhirih’s public unveiling was a dramatic sentence saying no. Among the followers of the Bab, Mulla Husayn and especially Quddus are often considered as the most prominent leaders. We would like to argue that, in fact, Táhirih was equally, if not the most, influential individual in shaping the overall direction of the Babi movement once the Bab was put under arrest. Táhirih helps us imagine a more diverse feminism and a more progressive Middle East, not the one the media sells us. Her legacy is not limited to Bahá’ís but belongs to all of us. Revisiting figures like Tahirih helps us appreciate the plurality of ways in which women have changed history. Two years after Badasht, Táhirih was arrested and taken to Tehran. On separate accounts, the son of the mayor and an Austrian physician – both eye witnesses – described her death during a wave of repression that took the lives of thousands of Babis. 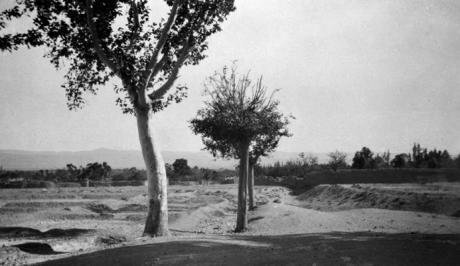 On a night in August 1852, government guards forced Táhirih from the place she was arrested and took her to a field just outside Tehran. In her mid-thirties, she was strangled to death – with her own veil, as she requested. Her body was pushed into a hollow well and rocks were thrown on top of it. It is for us to take one by one the rocks out of that well.